This is a quick midweek supper: supplement it with a salad and make sure you don’t eat it all as it’s delicious cold for lunch the next day! Asparagus has a short season – this was beaten into me while living in England when everyone (well, everyone interested in food) goes a bit mental banging on about the 6 weeks of the year you can buy English asparagus. Anyway, it’s asparagus season now in Australia and you can should be able to pick some young tender stalks up cheaply. 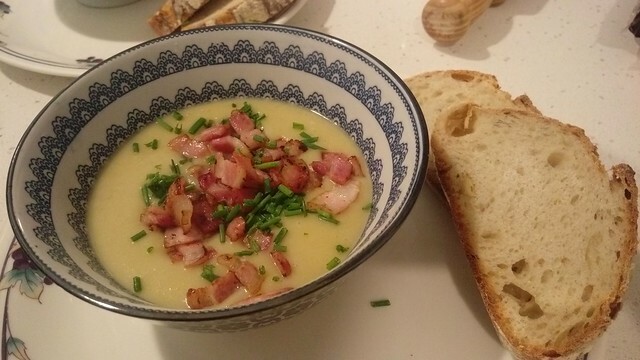 This is another proper storecupboard meal – once you have your asparagus everything else you’ll probably have hanging around the house. Begin by making your pastry (or, grabbing some pre-made shortcrust from the freezer). I always make shortcrust because, with the aid of a food processor, it’s so quick it’s a shame not to. My basic recipe is 150g of plain flour, 75g cold, unsalted butter, 1 egg yolk (use the white to make meringues! ), a pinch of salt and cold water to bring it all together. Rest in the fridge, wrapped in clingfilm, for half an hour or so. This makes enough pastry for a 23cm (or so) tart tin. If you have the will, bake it blind – it does really pay off with a nice crispy base! For the filling, chop and fry 2 rashers of bacon. Spread this evenly over the base of the pastry case. Now add your fresh, roughly chopped asparagus. You might want to reserve 3 or 4 spears for decoration – you might not. I used the best part of 2 bunches of young asparagus. Whisk together 5 eggs, add a generous couple of tablespoons of thick cream, and season with pepper (no salt!). 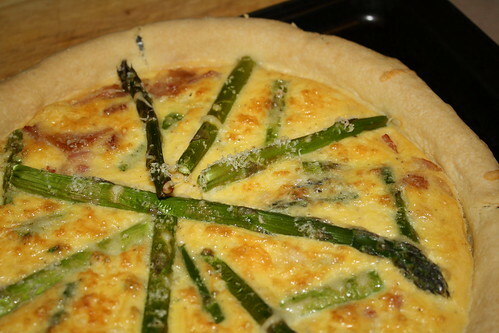 Pour over the bacon and asparagus, top with some grated parmesan and some grated cheddar and bake in an oven preheated to 160°C fan (or 180°C normal) for about half an hour – until the egg is puffed up and the tart is golden. You don’t need to serve this piping hot – as the warmer weather approaches, room temperature would be perfectly acceptable. The tart filling will sink back a bit as it cools, but it will still look – and tast – fantastic.